According to Preservation Society of Chapel Hill executive director Ernest Dollar, a long-lost chapter of Orange County history that has recently been discovered could just as easily be lost. At a press conference on Wednesday, Dollar revealed new facts about the Hogan family and their slaves who lived at the historic Hogan-Rogers house at 1614 Purefoy Drive in Chapel Hill, near the historic Rogers Road neighborhood. The information Dollar revealed showed that the descendants of one of the Hogans’ slaves, named Harriett, share DNA with Thomas Lloyd Hogan, who built the Hogan-Rogers house in 1843. “The history of this house is such a wonderful history of … white and black families who had lived here,” Dollar said. However, the house and its history could disappear, as the plot of land where it sits is planned for the new St. Paul AME church complex, with construction set to begin in November. Dollar hopes this DNA discovery along with the house’s lengthy history will help convince local governmental officials to move the historic home to the Rogers Road neighborhood and turn it into a neighborhood community center. After becoming aware of the house through a community meeting, Dollar visited the structure and immediately became intrigued, deciding to venture into the abandoned house to see what the interior would reveal. “I suspected there might be some secrets down there,” Dollar said. What the fireplace told Dollar was that while the Hogans were living in the upstairs part of the house, the slaves they felt they needed the most and were closest to the family were living and working in the basement. Dollar then wrote and published an article online about his findings and the dynamic between the white family and the black slaves. In his article, Dollar discussed a slave named Harriett, who was willed, along with the house, from Thomas Lloyd Hogan to his son William J. Hogan. Two weeks after publishing the article, Dollar received a call from a woman named Deardra Green-Campbell, who said she was a descendent of a woman named Harriett Hogan. Green-Campbell believed her relative was the same Harriett mentioned in the article. However, the next two things Dollar received from Green-Campbell made him optimistic about the connection. 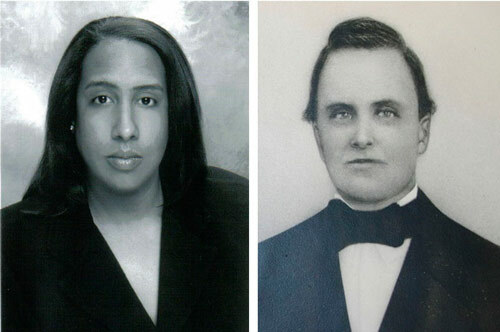 Green-Campbell sent Dollar a picture of herself, which he compared with a picture of William J. Hogan; the resemblance left him stunned, Dollar said. Next, Green-Campbell sent Dollar a government document in which one of her relatives listed Harriett and William Hogan as his parents. “To have a black man put on the record that he had a white father was incredibly brave,” he said. Dollar knew the next step to prove the connection was to get a DNA sample. So Green-Campbell approached Haywood Hogan, a distant cousin she had spoken with, and asked him for a sample. Using previous DNA work by Cleo Hogan, another distant cousin, the DNA linked Haywood Hogan and Green-Campbell back 10 generations to Thomas Hogan, and connected Haywood Hogan to a side of his family he never knew.